Sweden is considered as being one of the happiest countries in the world. It has much to do with the rise of its Lagom philosophy, which threatens to oust Hygge as the Nordic concept par excellence. According to this theory, the secret of happiness is based on a way of life that encourages us to escape from the eccentric things to find order and balance as a formula for joy and positivism. In a country with freezing temperatures and few daylight hours, home is a very important place in people's lives. For this reason, the Swedes apply 'lagom' to interior design, which looks to creating places of order and happiness. Literally, 'neither a lot nor a little, the best in its right measure', Lagom promotes a simple and sustainable way of life, of ample and orderly spaces, in which serenity and high levels of light prevail over everything. Reducing our environmental impact, improving the balance between work and our private lives, getting a house which is always tidy, and feeling good. These are the foundations of this Nordic trend. But to get a 'lagom' home, it is necessary to follow a series of guidelines, feasible for carrying out with the designs for architecture and interior design by the PORCELANOSA Grupo. Lagom defends the idea of banking on durable and high-quality products, designed to be unalterable over time and it suggests quietness and natural character. In addition, the Swedish philosophy advocates energy efficiency and minimal expenditure of natural resources. 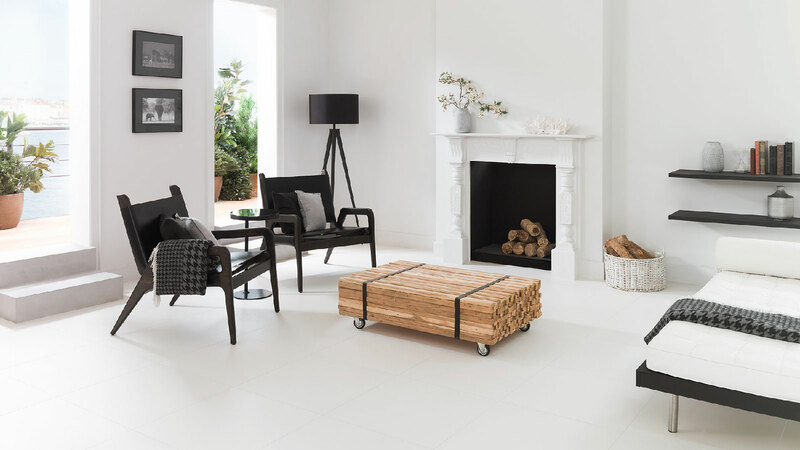 The PORCELANOSA Grupo quality and responsibility seal is present in Porcelanosa floor tiles which are inspired by wood, like the PAR-KER Forest ceramic parquet. 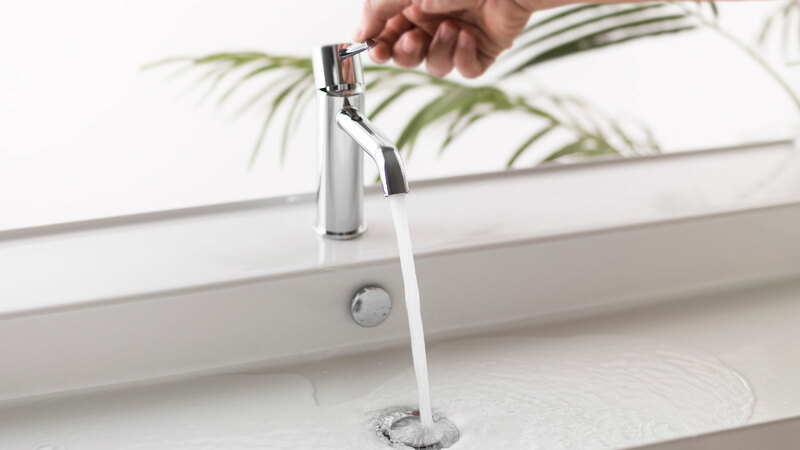 Made with 95% recycled material and great versatility, it can be installed in any room, including the kitchen and bathroom, which makes life that much easier.Bathroom taps, like Round by Noken Porcelanosa Bathrooms, manage to take a step towards sustainability by saving water and energy, thanks to its flow limiter and cold opening system. Its chrome finish is also very consistent with lagom's aesthetic austerity. 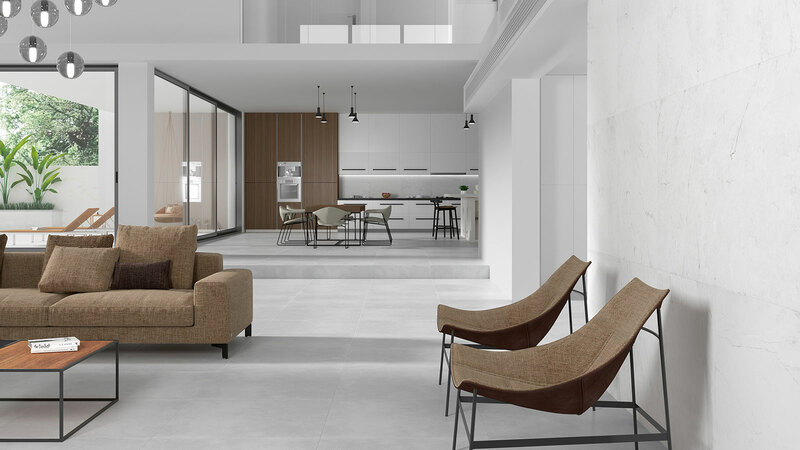 Urbatek, for its part, proposes to fulfil this philosophy of balance and order with its Maker Ice large sized porcelain tile, in a timeless broken white sandstone finish. 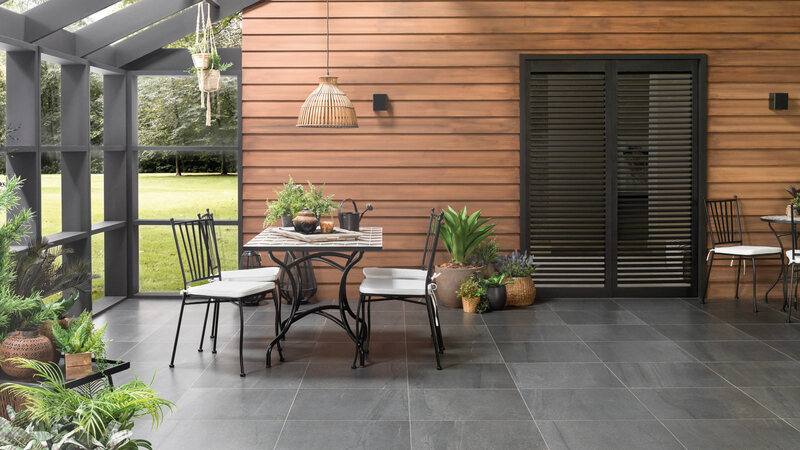 This porcelain tile also contributes to the defense of the environment and the achievement of eco-sustainable buildings, thanks to its 35% recycled material. A Lagom home is one that is based on neutral colours. White or greys with a lighter tone can be the principle on which to enhance spaciousness and the incoming natural light. Jointless surfaces, like those used to create the Micro-Stuk continuous wall tile by Butech in its White, Snow, Grey and Beige tones, are a perfect option for those which include decorative pieces. 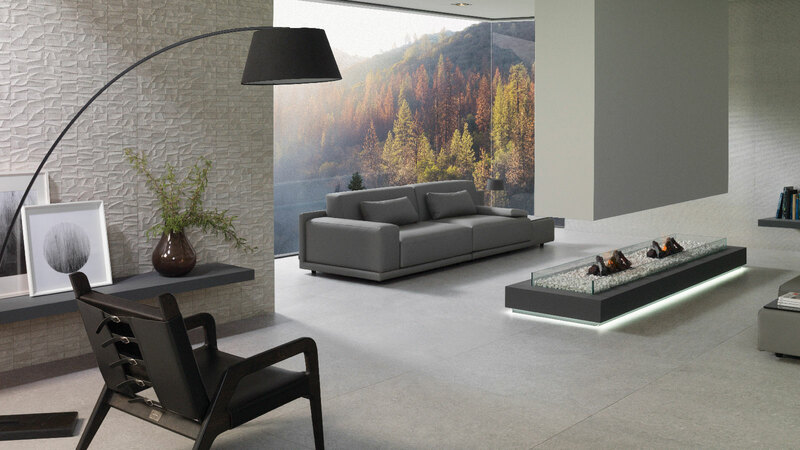 Cutting-edge ceramic elements, like the Rivoli collection by Venis in white tones with subtle grey veins that enhance the minimalist philosophy, can help to achieve that serene balance that Lagom is looking for. 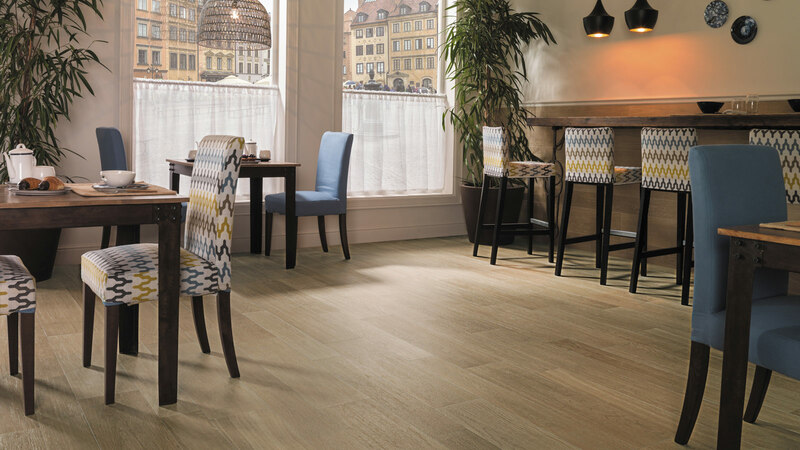 Just like the new Metropolitan Nature line, which presents a discrete yet elegant pattern that fits perfectly with this style. However, in this trend, not everything is simple and sober. Lagom defends 'the best in its right measure' through, for instance, walls of clear tones with just one decoration which stands out. A mosaic like Prada Acero by Porcelanosa can contribute to that decorative function that escapes from the eccentric. 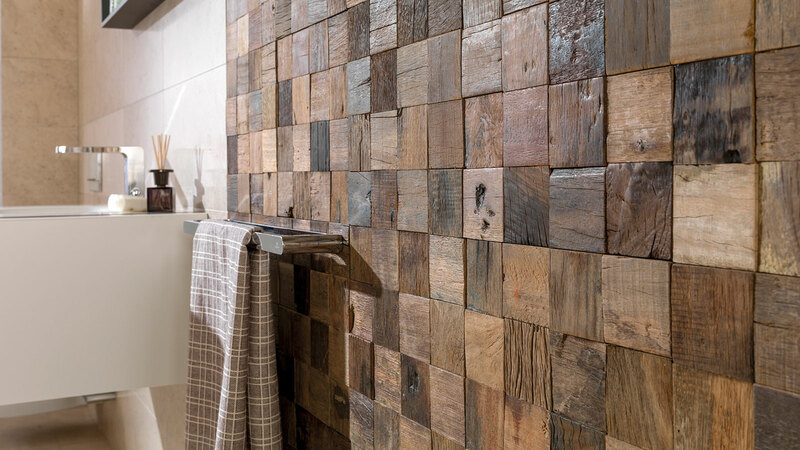 The mosaics from the Wood collection by L'Antic Colonial are also aesthetically subtle and elegant, standing out because of their natural character since they are made of oak, teak, cumaru or recycled wood. The purpose of Lagom is to create a warm place that makes people happy, to provide peace of mind when closing the front door behind you. That is why it is so necessary to look for the visual balance to find harmony and avoid disorder. Furniture or shelves can help that tidy storage. We must also bear in mind that in certain rooms, order becomes more relevant when it is in continuous use. This is the case of the bathroom or the kitchen. 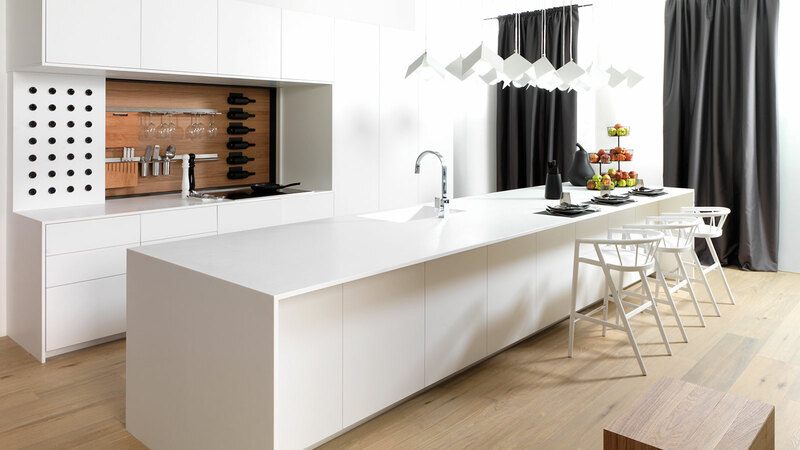 Gamadecor, for example, designs very 'lagom' kitchens such as E4.00 or E6.70. In both cases, practicality and order mark the lines through a large work space and large storage capacity. 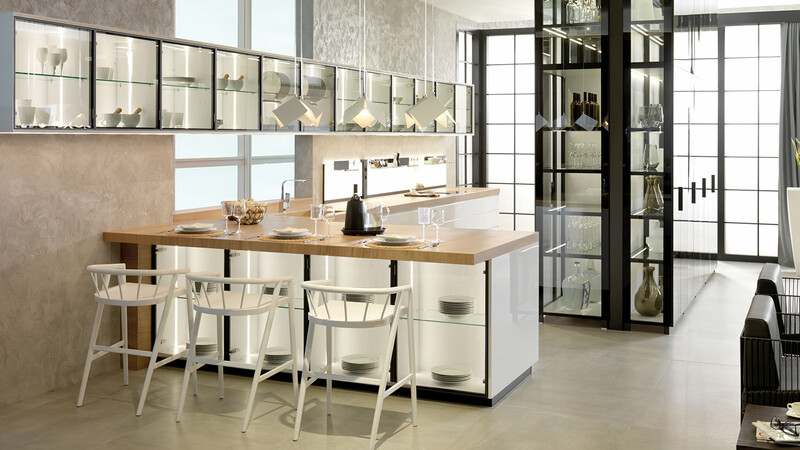 Made with sober and clear materials such as oak or KrionTM Blanco Puro, its set up is designed to offer more functionality in a minimum space. To complete this very personal style, it is crucial to put objects of a sentimental nature which go well with the decoration. Having them in view suggests positive thoughts in everyday life. Good taste with moderation and sustainability. That's what 'lagom' homes are like. The Swedish secret of happiness with the PORCELANOSA Grupo.